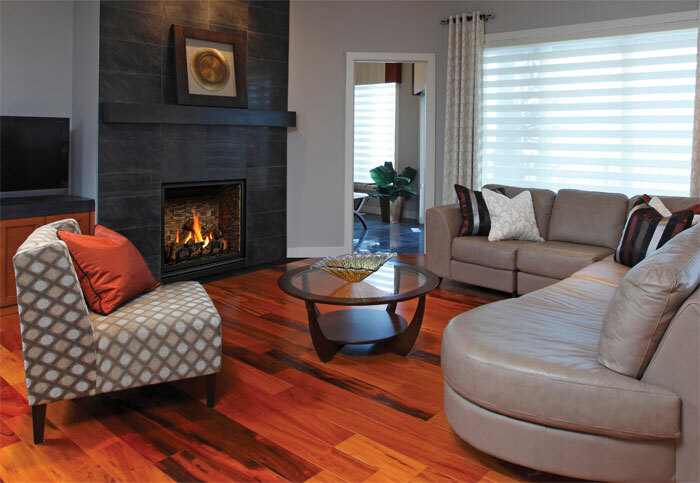 The Advantages of a Decorative Grade Fireplace: Style and Function Unite! This entry was posted in Fireplaces on March 13, 2018 by The Original Flame Author. Here at The Original Flame, one of the most important topics we cover as we chat with clients about their fireplace ideas and design is to balance the size of the room/area in their home with how much heat the fireplace that they’re most interested in delivers. Most people don’t need a fireplace with a tremendous amount of heating capacity or efficiency because typically they already have a high-efficiency source of heat in the house (like a gas or propane furnace). This is where a decorative grade fireplace can come in handy. What’s a decorative grade fireplace? A decorative grade fireplace is a natural gas or propane fireplace that has been designed by the manufacturer to provide less heat. Typically, decorative grade fireplaces have an optional fan and use a hardened glass called tempered glass that blocks some of the heat. Why buy a fireplace that blocks heat? The big reason that we sell quite a few decorative fireplaces is that it can be extremely easy to overheat a space, especially with modern, tight home construction. Decorative grade fireplaces are by no means a “no heat” fireplace. To generalize, even our smallest decorative grade fireplaces will still take the dampness out of 4-500 square feet room. In the event of a power failure, a decorative fireplace will still provide some heat. If your gas fireplace puts out too much heat you will only have it on for a short period of time, missing out on the aesthetic appeal. If your principal goal in your fireplace renovation decision is to be cozy and comfortable without having to shed layers, come and chat with us about your space, see our burning gas fireplace display units and, if you like what you see, have us over to your home to give you a quote and talk to you about what’s most appropriate for your space!